Escherichia coli a model organism provides information for annotation of other genomes. Our analysis of its genome has shown that proteins encoded by fused genes need special attention. Such composite (multimodular) proteins consist of two or more components (modules) encoding distinct functions. Multimodular proteins have been found to complicate both annotation and generation of sequence similar groups. Previous work overstated the number of multimodular proteins in E. coli. This work corrects the identification of modules by including sequence information from proteins in 50 sequenced microbial genomes. Multimodular E. coli K-12 proteins were identified from sequence similarities between their component modules and non-fused proteins in 50 genomes and from the literature. We found 109 multimodular proteins in E. coli containing either two or three modules. Most modules had standalone sequence relatives in other genomes. The separated modules together with all the single (un-fused) proteins constitute the sum of all unimodular proteins of E. coli. Pairwise sequence relationships among all E. coli unimodular proteins generated 490 sequence similar, paralogous groups. Groups ranged in size from 92 to 2 members and had varying degrees of relatedness among their members. Some E. coli enzyme groups were compared to homologs in other bacterial genomes. The deleterious effects of multimodular proteins on annotation and on the formation of groups of paralogs are emphasized. To improve annotation results, all multimodular proteins in an organism should be detected and when known each function should be connected with its location in the sequence of the protein. When transferring functions by sequence similarity, alignment locations must be noted, particularly when alignments cover only part of the sequences, in order to enable transfer of the correct function. Separating multimodular proteins into module units makes it possible to generate protein groups related by both sequence and function, avoiding mixing of unrelated sequences. Organisms differ in sizes of groups of sequence-related proteins. A sample comparison of orthologs to selected E. coli paralogous groups correlates with known physiological and taxonomic relationships between the organisms. Eschericia coli remains a useful resource to the genomic community as it provides important knowledge which can be applied to the analysis of most microbial genomes. Its central role devolves from two facts; first, the accumulated results of seven decades of laboratory experimentation have identified the function(s) of over half of its gene products; second being a metabolic generalist, E. coli's metabolic functions are widely shared among other organisms. Common practices of annotation rely, more than one might realize, on the accuracy of the annotation of E. coli's genes. While searches for sequence matches to unknown genes usually yield a large number of matches, chances are high that firm functional information comes only from experimental studies on E. coli. Because annotations of genes do not always indicate that the assignments are derived, and because derived annotations are used serially for further annotation without experimental confirmation, many genes carry original E. coli annotations. It is therefore important to the entire genome-analyzing community that the data on E. coli gene products be as accurate as possible. Since the original GenBank deposit of E. coli K-12 (U00096), new and updated annotations are available at NCBI (U00096.2) and at more specialized databases including, ASAP , coliBASE , CyberCell , EchoBASE , EcoCyc , GenProtEC , and RegulonDB . An effort is under way to coordinate the current E. coli annotations . Over recent years, our work on the E. coli genome has led us to an appreciation of the pernicious role that gene fusions often play as troublemakers in function assignments and in relating groups of sequence similar proteins . The fusion of two independently functioning genes results in the formation of a composite (multimodular) protein encoding for two independent functions located at separate parts of the protein. This type of fusion is not equivalent to the joining of protein domains, i.e. domains encoding binding sites for a cofactor or a substrate, which is seen in multidomain proteins. An example being the enzyme glyceraldehyde-3-phosphate dehydrogenase which according to the domain databases Pfam  and Superfamiliy  contains two domains, an NAD binding site and a dehydrogenase catalytic site. In our studies the entire protein including both domains represents one independent functional unit with one activity. Multidomain proteins are more prevalent and most often encode one overall function for the gene product . Annotation involving transfer of function from composite proteins to sequence similar matches requires that the alignment regions be evaluated in order to determine whether all activities or only one of them should be assigned to the matching sequence. Currently fused proteins are themselves not always annotated to reflect that they encode more than one function, and rarely is the location of the separate functions indicated. Different combinations of fused genes are seen in the sequenced genomes, adding potential sources for annotation errors. Errors in functional assignments including those caused by fused genes have been noted years ago  and that such proteins may contribute to propagation of annotation errors in databases . The fused proteins also interfere with the generation of sequence related protein groups as they link proteins based on their coexistence in a fused protein and not purely based on sequence similarity. Components of fused genes are often not sequence related, so generating protein groups without taking gene fusions into account may result in "mixed" groups of proteins with different sequence relatedness, functions and evolutionary histories. Previous work has been published where we identified fused E. coli proteins from partial alignments between proteins encoded in the E. coli genome . This work resulted in the identification of 287 multimodular proteins. As our analysis continued and more genome sequences were incorporated in our studies we realized that most of these identified multimodular proteins actually contained multiple domains and had one overall function. We have therefore revised our method of detecting fused proteins. We are making use of sequence information from 50 genomes including E. coli to detect proteins which are fused in the E. coli genome and are present as individual components in one of the other genomes. We have also made use of published experimental data on E. coli gene fusions. As a result the number of fused proteins in E. coli has been reduced to 109. The number of groups of sequence related proteins was also reduced from 609 to 490 since some of the previously identified groups are made up of protein domains catalyzing only part of an overall reaction. This work represents a revision of the state of fused proteins in the E. coli genome their affect on genome analysis both within E. coli and across genomes. To prevent confusion, we define multimodular proteins as those seeming to result from gene fusion in which two independent proteins are connected. Multimodular proteins encode separate functions in different parts of the molecule. These functions might be the same if two like elements have fused, or as we see more often in E. coli, they differ in sequence and activity. Distinctly different, multifunctional proteins are defined as those that carry out more than one reaction or activity in the same part of the protein. Examples of such multifunctional proteins are encoded by the genes cob U, bir A, ubi G, fol D, cys G, tes A, and ndk (for details see gene products at GenProtEC ). A protein that illustrates both properties is the FadB protein of E. coli [17, 18]. FadB is a multimodular protein with N-terminal and C-terminal modules. Its N-terminal module is multifunctional with three activities that are catalyzed at the same active site and cannot be spatially separated along the length of the protein. The three activities are 3-hydroxybutyryl-CoA epimerase, delta(3)-cis-delta(2)-trans-enoyl-CoA isomerase, and enoyl-CoA hydratase. The C-terminal module of FadB encodes a single function, 3-hydroxyacyl-CoA dehydrogenase. Adding the N-terminal and C-terminal modules, there are 4 activities for the FadB protein. In earlier work, before the genomic sequence of E. coli was completed, we saw that sequence similarity among its proteins was widespread [9, 19]. After the entire sequence was available, we identified 287 E. coli proteins as being multimodular and encoded by fused genes [15, 20]. The modularity of the proteins was inferred from the alignments among E. coli proteins. However, we have since found that many of these so-called multimodular proteins were proteins containing more than one domain and not more than one protein. Such multidomain proteins may appear to encode two functions but in reality encode two or more conserved motifs (i.e. DNA-binding and effector-binding domains of LysR type transcriptional regulators). By including sequence information from other genomes besides E. coli we were able to better distinguish fusions of complete proteins versus the more common fusions of protein domains. Of the 287 proteins previously identified as multimodulars only 70 remained as fused proteins in this study with the remaining representing domain fusions. In the present work, some of the fused proteins were identified by searching the literature for experimental data. Examples of E. coli proteins long known to contain multiple functions encoded at separate parts of the proteins include GlnE , MetL , ThrA , and TyrA . We have collected such experimentally verified information over time , labeled as multimodular proteins with literature citations in our database GenProtEC . Other multimodular proteins were identified by selected types of alignments between E. coli proteins and proteins encoded in 50 sequenced genomes. The component proteins of a multimodular protein may be unimodular and unfused in another genome. We looked for alignments between the larger potentially multimodular proteins in E. coli and smaller orthologous proteins that are homologous to only one of the modules (Figure 1a). Not all gene fusions of E. coli will be detected by this method. For instance elements of a fused gene may have diverged to the point where the component modules no longer have detectable similarity to their homologous counterparts, or the independently existing modules may have been lost from the gene pool of the 50 genomes analyzed, or the 50 organisms may contain only the multimodular form. 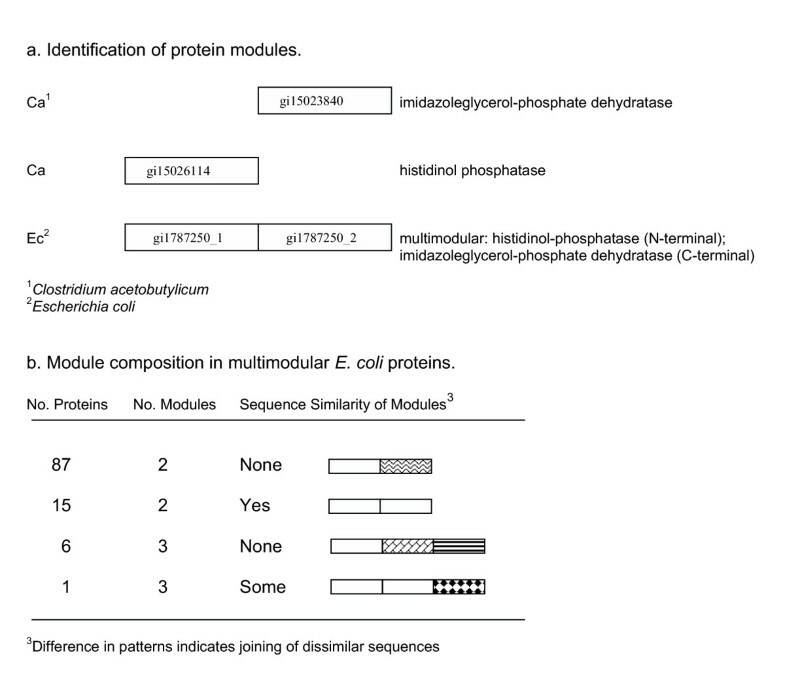 Identification and sequence similarity of multimodular E. coli proteins. (a) An E. coli protein (gi1787250) aligns with two smaller proteins from C. acetobutylicum, histidinol phosphatase (gi15026114) and imidazoleglycerol-phosphate dehydratatase (gi15023840). The E. coli protein represents a fused or multimodular protein encoding the two functions in separate parts of the protein as indicated by the two non-overlapping alignment regions. Based on the alignment regions, the E. coli protein is separated into two separate components, modules. The modules are identified with the extensions "_1" or "_2" to indicate their location in the gene product as N-terminal or C-terminal, respectively. (b) Sequence similarity between modules of the multimodular proteins is shown. No detectable similarity between the joined modules is indicated by a difference in the module patterns in the cartoon. Similarity is measured by Darwin and indicates that the proteins align at a distance of ≤ 200 PAM units over at least 83 amino acid residues or >45% of the length of the proteins. This level of similarity also reflects whether the modules belong to the same paralogous group. In total we identified 109 E. coli proteins to be multimodular, with 101 containing two modules and 8 containing three modules. The largest number of multimodular proteins joined modules of dissimilar sequence (illustrated in Figure 1b). An abbreviated list of the modules and their functions is shown in Table 1. A complete list of the multimodular E. coli proteins is made available: ' [see Additional file 1]'. The remaining proteins, 97.5 % of the total, were considered to be unimodular. The average length of the multimodular proteins was 637 residues compared to 309 for the remaining proteins in the chromosome (Figure 2). 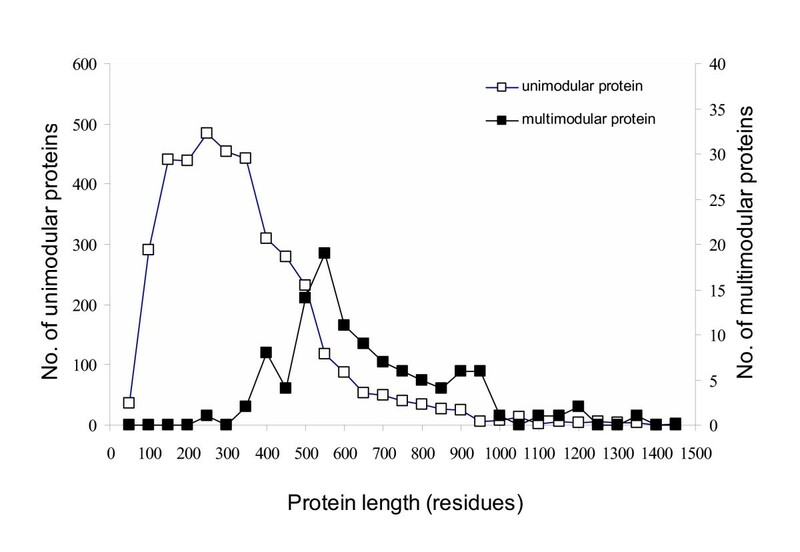 Individual modules from the multimodular proteins were on average 300 residues long, similar to the length of the unimodular proteins. However, the size alone of a protein does not reflect multimodularity as we found many large proteins to be unimodular. Examples of multimodular E. coli proteins. 1Gene product type: e, enzyme; pe, putative enzyme; r, regulatory protein; pr, putative regulatory protein; t, transport protein; pt, putative transport protein; pc, putative carrier protein; o, unknown function. Size distribution for multimodular and single module proteins. The protein lengths in amino acid residues are shown for single module proteins (□) and for multimodular proteins (■). On average the multimodular proteins are longer than the unimodular proteins, 637 amino acids versus 314 amino acids. The length of a protein alone does not infer multimodularity and long single module proteins are seen. Table 2 shows some characteristics of the modules in the multimodular proteins. The majority of the E. coli modules, 90%, were found to have homologs existing as independent proteins in one of the 50 genomes analyzed. Independent unimodular homologs within E. coli were detected for only 57% of the modules (data not shown). A list of the major types of multimodular proteins is shown in Table 3. 1Gene type includes known and putative functions. 2Protein names derived from gene names. • Many of the multimodular enzymes function in the biosynthesis or degradation of compounds (amino acids, cofactors, peptidoglycan and fatty acids). • The majority of the multimodular transport proteins encode fusions of components of the ABC superfamily transporters (ATP-binding and membrane component). Also, fusions of the PTS proteins were detected in different combinations. Thirteen proteins contained two or more PTS components, including Hpr, enzymes I, IIA, IIB, or IIC. • Among the multimodular regulatory proteins, two-thirds were part of two-component regulatory systems and contained histidine kinases fused to response regulators. Seldom were known domain subdivisions within these modules detected by the rules we applied. While the fraction of enzymes (39%) is similar to the fraction of enzymes encoded in the genome as a whole (36%), the proportion of multimodular transport proteins (38%) and regulatory proteins (17%) were higher than their proportion genome wide (14% and 8% respectively). The over-representation in transporters and regulators is a reflection of the level of gene duplication seen for these proteins. Large paralogous groups are detected for some of the ABC transporter protein subunits and for components of the two-component regulators. All unimodular proteins, including the modules obtained from multimodular proteins, were tested pairwise for sequence similarity. Matching all single module E. coli proteins to each other using the AllAllDb algorithm of the Darwin package, we collected all aligned pairs with a similarity score of less than or equal to 200 PAM units, with an alignment of at least 83 residues. Altogether 9,626 unique pairs met these criteria (data available at GenProtEC ). We used the data on pairwise similarity to assemble groups of proteins of similar sequence that were unlike other proteins in the cell. Besides the PAM less than 200 and alignment length of at least 83 residues, two additional requirements were imposed; that more than 45% of each protein in each pair be aligned, and that a module could not belong to more than one group. A transitive clustering process was used to form the sequence-similar groups . This grouping method requires only that each member of the group have sequence similarity to at least one other member of the group and does not require a detectable similarity among all the members of a group. Both closely related groups and groups with more divergent proteins were found. We identified 490 sequence-similar or paralogous groups in E. coli ' [see Additional file 2 for a complete list of the sequence-similar E. coli groups and their members]'. Altogether 1946 unimodular proteins belonged to one of the groups. Modules from 94 of the multimodular proteins were present in 61 of the groups. Table 4 shows the power law type of distribution of the number of members in the groups, smaller groups being more abundant than large ones. There were 279 groups of two proteins, and only 10 % of the groups had 7 or more members. As shown in Table 5, the smaller groups tended to be tight groups in which the majority of sequences were related by our criteria to all or most others in the group. Larger groups were more divergent with a minority of members related to all others. At group size 8 and above, no members have the property of relating to all others. Size distribution of paralogous groups. Sequence relationships within paralogous groups. The largest groups of paralogous enzymes, transport proteins and regulatory proteins are shown in Table 6, 7 and 8, respectively. While enzymes represent the largest gene product type in E. coli with known or predicted function, they tend to be present in smaller paralogous groups as compared to the transporters and regulators. Among the larger groups the oxidoreductases and the subunits of oxidoreductases are most common, making up 8 of the top 20 enzyme groups (Table 6). Paralogous enzyme groups in E. coli. 1Contains GroES-like structural domain (SCOP sf50129). Paralogous regulatory protein groups in E. coli. ATP-binding components of the ABC superfamily of transport proteins are highly conserved and make up the overall largest paralogous group in E. coli (Table 7). The other two components of the ABC superfamily transporters are less conserved with membrane components in groups of 52 or less and periplasmic binding components in groups of 9 or less. Components of the PTS system; enzyme IIA, IIB, IIC and I also formed sequence similar groups. One of the groups classified as a group of transporter proteins actually contains both transport proteins (periplasmic binding components of the ABC superfamily) and regulatory proteins (transcriptional regulators of the GalR/LacI family). These two functional types are sequence related, and all of the proteins contain a common structural domain (SCOP sf53822) for the binding of small molecules [25, 26]. The difference lies in the presence or absence of a DNA-binding domain. Response regulators of two-component regulatory systems make up the largest group of regulatory proteins in E. coli (Table 8). Sensory histidine kinases of two-component regulatory systems and the sigma54 activating proteins also constitute paralogous groups. A group almost equal in size to the response regulators is the LysR-family of transcriptional regulators. Other large groups of transcriptional regulators are also present. In addition to using paralogous groups for intra-genomic analyses, the groups were also used in cross genome comparisons (see Table 9). The sizes of selected sequence related groups are shown for three bacteria, the closely related enterics E. coli and Salmonella enterica serovar Typhimurium and the more distantly related organism Bacillus subtilis. The sizes of the groups in the closely related bacteria are similar, whereas there are differences in relation to B. subtilis, a gram positive soil organism. For instance, the largest E. coli enzyme group containing Fe-S-binding oxidoreductases was represented by only one homolog in the B. subtilis genome. However, B. subtilis encodes for 31 oxidoreductases homologous to the group of 18 NAD(P)-binding oxidoreductases of E. coli. The number of homologous sugar kinases, respiratory reductase subunits, and nucleoside diphosphate (Nudix) hydrolases appeared overall to be lower in B. subtilis. Cross genome comparisons of enzyme groups. 4Contains GroES-like structural domain (SCOP sf50129). We have attempted to enumerate fused genes in E. coli in earlier work. Although we recognized the difference between independent proteins with complete function, called modules , as opposed to parts of proteins such as motifs and domains, we were not successful in our most recent effort in collecting only complete proteins to the exclusion of domains [15, 27]. In earlier work we depended on size as a criterion to eliminate domains, but we know now some domains are large and overlap the lower range of sizes of independent proteins . We also limited our previous studies to alignments between E. coli proteins. In this report we make use of information from 50 genomes to detect complete and independent protein homologs for the components of the fused E. coli proteins. The need to make use of additional genome sequences is supported by the fact that only 57% of the modules in fused E. coli proteins had unfused homologs within the E. coli genome while 90% had homologs among the 50 genomes. This result suggests that additional fused E. coli proteins might be detected in the future with more available genome sequences. The overall effect of changing the methodology has been to reduce the numbers of multimodular proteins identified in E. coli K-12. As a result of reducing the number of fused proteins, the number of paralogous protein groups was also reduced. The grouping process is based on similarity between the sequences hence many parts of the same proteins remained together in the new groups. For many years we have known that the E. coli contained fused genes and groups of sequence-similar proteins . Today with the sequence of the entire genome and that of many other microbial genomes, we can quantify the gene fusions in E. coli and apply this information to generate paralogous groups. Even though we find that multimodular proteins are a minor fraction, 2.5%, of the proteins in E. coli K-12 MG1655, they significantly affect the annotation of related genes and the ability to define paralogous genes within a genome. Examples of the types of errors arising in the annotation of fused proteins are shown in Figure 3a. The multimodular protein ThrA (gi1786183) encodes an aspartokinase in the N-terminal module (aa 1–461) and a homoserine dehydrogenase in the C-terminal module (aa 464–820). A sequence similar protein from Lactococcus lactis, gi12723655, aligning only to the N-terminal module is erroneously annotated as having both aspartokinase and homoserine dehydrogenase activities. 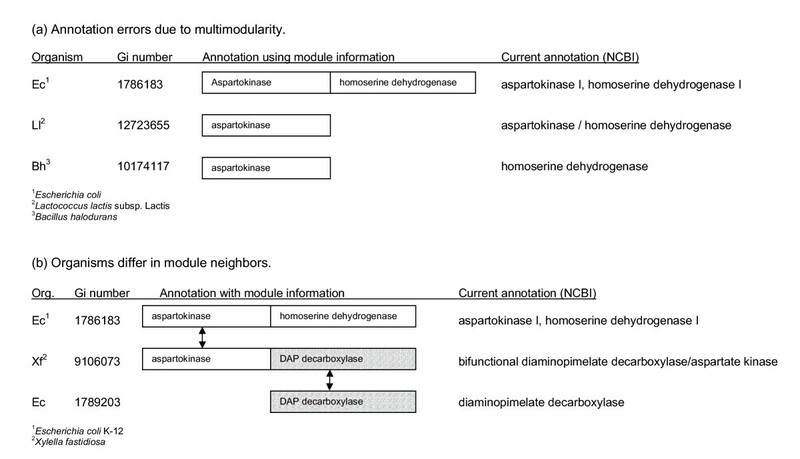 The correct annotation should be aspartokinase. In a second example, a protein from Bacillus halodurans, gi10174117, aligns to the aspartokinase module of ThrA but is described as homoserine dehydrogenase. The correct assignment should be aspartokinase. 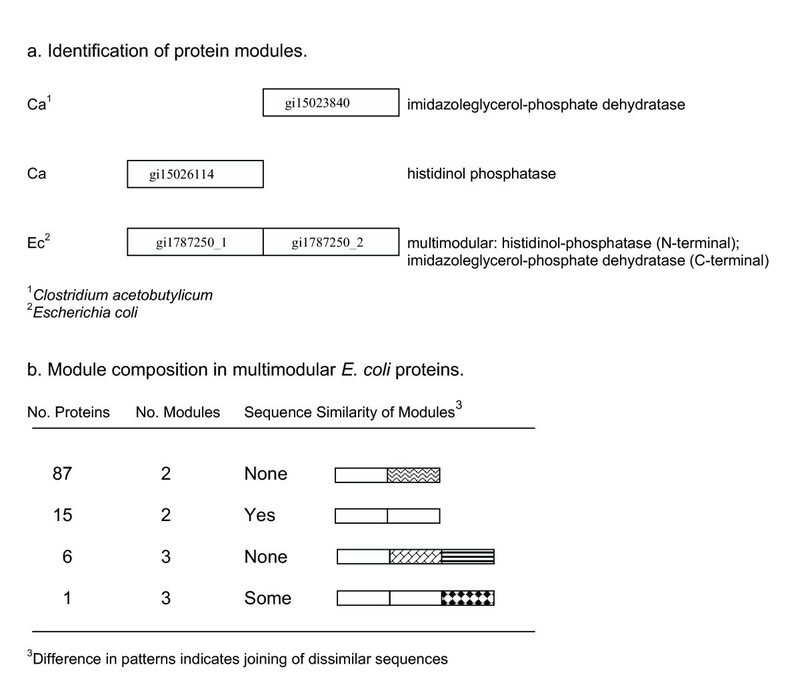 Annotation and composition of multimodular proteins. (a) Annotation is complicated by multimodular proteins. An E. coli protein (gi1786183) contains two modules, an N-terminal aspartokinase and a C-terminal homoserine dehydrogenase. Two single module proteins from L. lactis and B. halodurans (gi12723655 and gi10174117) align to the N-terminal aspartokinase module of the E. coli protein. Based on the sequence alignments, both of these proteins should be annotated as aspartokinases. However, errors are seen in the annotation of the L. lactis and B. halodurans proteins stemming from transfer of functions between multimodular proteins and partially aligned sequences without taking into account the alignment regions. (b) Different combinations of modules are seen in multimodular proteins of different organisms. While aspartokinase is fused to homoserine dehydrogenase in E. coli it is fused to DAP decarboxylase in X. fastidiosa. In both organisms the fusions are between enzymes of metabolic pathways, threonine biosynthesis for E. coli and lysine biosynthesis in X. fastidiosa. As shown in Figure 3b, different genes are sometimes fused to the same gene in different organisms. In E. coli an aspartokinase is fused to a homoserine dehydrogenase (gi1766183), while in Xylella fastidiosa, an aspartokinase is fused to a diaminopimelate decarboxylase (gi9106073). One needs to be alert to partial alignments. In this case, the annotation is correct for both activities of the Xylella protein, although the description does not follow the convention of stating the N-terminal activity first, raising the potential for misidentification of the activity of a partial homolog. The details of gene duplication and divergence and of gene fusions have followed different courses in separate lines of descent of bacteria. The fusions of different gene partners to aspartokinase in E. coli and X. fastidiosa connected proteins acting in the same pathway. However, the pathways are different for the two organisms, threonine biosynthesis for E. coli and lysine biosynthesis in X. fastidiosa. Fusions of genes in a pathway have long been known and also the fusions of different genes in different organisms. In the tryptophan biosynthesis pathway of E. coli both the trp C gene (formerly trpC(F)) and the trp D gene (formerly trp G(D)) encode two enzymes as indicated in their former names. In contrast Rhizobium meliloti has a fusion between the trp E and trp G genes, trp E(G) . Such differences not taken into account in annotation have generated errors in assignment of activities in some of the tryptophan synthesis proteins in a number of organisms. The variability in gene fusions among bacteria means that definition of multimodular proteins cannot be transferred from one organism to another, but must be worked out by analyzing the partial homology patterns with smaller independent proteins found in other organisms. To promote awareness of fused proteins, databases should list such proteins with their separate component activities and the approximate locations of these; either by start and end residues, or by module location (N-terminal, C-terminal, or Middle for proteins with >2 modules). Such a format has been implemented in GenProtEC . When analyzing protein sequence alignments, one should make use of information on the alignment lengths and on the percent of each sequence that is involved in the alignment. Such information may hold clues to detecting fused proteins. Groups of unimodular E. coli proteins similar in sequence vary in size from two (simple pairs) up to 92 members (Table 4). From pairs to groups of 8, the number of paralogous groups follows a power law. Above size 8, most sizes are represented by just one or two groups. For the smallest groups, two to four members, the degree of sequence similarity (PAM scores) tend to range widely (Figure 4). As the groups are larger, a clear distribution around PAM 150 emerges. Perhaps the larger groups are ones whose success is reflected in many duplication events over time with a retained function if the sequence drift is held to the range 100 to 200 PAM units. It appears that choosing 200 PAM as the upper ceiling has not eliminated an important number of groups with highly diverged members. Also, the broad range of degree of relatedness among members of paralogous groups (Table 5, Figure 4) suggests that some types of proteins diverge further than others. The cluser around PAM 150 is populated by large successful paralogous groups, some of which are closely related in catalytic function while others have diverged to more distantly related activities. Sequence similarity of E. coli paralogous protein groups versus the group size. Protein sequences were aligned by the AllAllDb program of Darwin. Multimodular proteins were separated into modules (independent functional units) prior to the Darwin analysis. Alignments with similarities of ≤ 200 PAM units over 83 amino acids and where >45% of the length of both proteins in the pair were aligned were used to generate protein groups. 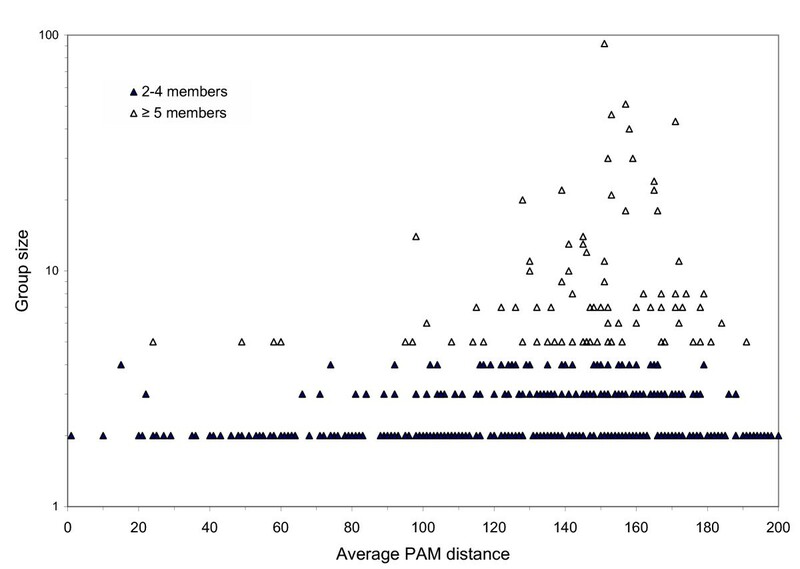 The average PAM distances for the protein pairs in the smaller groups having 2–4 members (▲) and in the larger groups of ≥ 5 members (△) are shown. The smaller groups are more abundant and show a wide range of similarities. The larger groups appear to be more divergent with higher average PAM values clustering around PAM 150. The largest paralogous groups are transporters and regulators (Tables 7 &8). Paralogous groups of enzymes tend to be smaller (Table 6). The largest enzyme classes tend to be oxidoreductases or subunits of oxidoreductases, and the relationships among members of these groups point in the direction of shared binding capacities accounting for the sequence relatedness, e.g. Fe-S clusters. In earlier work we found that some sequence related enzymes are alike in their ligand-binding characteristics, others are alike in mechanism of the catalytic action . Both types of shared properties are seen in Table 6. The ABC transporters have been a successful formula in bacterial evolution. The ATP-binding subunits maintain detectable sequence similarity. More divergent are the membrane subunits, and least similar are the periplasmic ligand-binding subunits, perhaps understandably divergent as their binding specificities for each transported compound will differ with the properties of the compounds . One of the groups of periplasmic binding components also contains sequence related transcriptional regulators of the GalR/LacI family, agreeing with previous reports [25, 26]. The major difference between these two functions is the presence or absence of a DNA-binding domain. According to Fukami-Kobayashi et al. , the regulators in this group are believed to have arisen by the fusion of a DNA binding domain to an ancestral periplasmic binding protein. The substrate specificity is thought to have evolved subsequently. Only a few of the transporters and regulators in this group bind the same substrates; galactose (MglB and GalR), ribose (RbsR and RbsB) and xylose (XylF and XylR). Among the regulator groups (Table 8), the class of two-component regulators is large. The two major activities of sensory histidine kinase and response regulators separate by the rules for grouping modules, but their known internal structures do not emerge. Many other groups are different kinds of transcriptional regulators. Another example of different functions related by sequence has been reported for a class of repressors and kinases, the ROK family . In this case the two different functions are sequence related via their sugar-binding domains and differ in their DNA-binding or kinase activity. Examining comparable paralogous groups among organisms may provide insight into functional and physiological differences among organisms. Illustration of the possibilities is shown in Table 9 where the sizes of comparable paralogous groups are shown for the closely related enteric bacteria E. coli and S. enterica serovar Typhimurium and the distant gram positive soil organism B. subtilis. Major difference is seen for one category of oxidoreductases. The largest enzyme group in E. coli contains 20 FeS-binding proteins whereas the B. subtilis genome has only one protein of this type. Members of the E. coli group include subunits of formate dehydrogenases, hydrogenases 3 and 4, DMSO reductase, and a NADH dehydrogenase. The presence of elements of the formate hydrogen lyase system and of the DMSO reductase in E. coli but not B. subtilis illustrates information on metabolic differences that emerges from such cross-genome comparisons. B. subtilis does not have the diverse anaerobic respiratory capability of E. coli and S. enterica. Duplication and divergence of this common ancestral gene seems to have taken a different course in the two bacterial lineages. In another example, B. subtilis has made use of one enzyme type to a greater extent than the two enteric organisms. The number of one of the types of NAD(P)-binding oxidoreductases is much larger in B. subtilis (31 proteins) than in the enterics (18 proteins). The B. subtilis enzymes in this group are fatty acid biosynthesis enzymes, agreeing with the known fact that this organism synthesizes a greater variety of fatty acids and has dedicated more of its proteome towards diversifying its fatty acid biosynthetic capabilities [33, 34]. Thus sequence similar groups may be used in comparative analysis between genomes, highlighting areas where genetic resources have been expanded, pointing up metabolic differences between organisms. • Proteins encoded by fused genes, multimodular proteins, require special attention in genome analysis. Such multimodular proteins contain two or more functional components that are located at separate parts of the protein and that may exist as independent proteins in other genomes. Annotation of the multimodular proteins should include the separate functions and their corresponding locations in the gene product. This will improve transfer of function between the fused proteins and sequences matching their entire length or only the length of one of their module components. Current annotation errors involving fused genes can be remedied by introducing this approach. • The identification of multimodular proteins in E. coli was improved by making use of sequence information from 50 genomes to detect alignments between the fused proteins and smaller, un-fused homologs corresponding to the component modules. The more common multidomain proteins, proteins containing fused sequence domains or motifs that together make up one overall function, were not detected as multimodular proteins by this approach. As a result the current number of fused E. coli proteins was reduced to 109 proteins with 8 containing three modules and 101 containing two modules. The multimodular E. coli proteins consist mainly of enzymes, regulators and transport proteins. Their component modules are often not related by sequence but many are related in that they function in a common pathway or cell role. Components of fused genes appear to vary from genome to genome hence complicating their detection and function assignment. • Multimodular proteins are different from multifunctional proteins in that the latter catalyze more than one reaction in the same region of the protein. • The generation of paralogous or sequence related groups is improved when the modules of multimodular proteins are separated and treated as independent proteins for the grouping process. 490 groups of sequence related E. coli proteins ranging in size from 2 to 92 were generated from the new module data. The smaller groups range widely in degree of relatedness while the larger groups have diverged from one another to about the same extent. Transport proteins and regulatory proteins were found in the larger groups while enzyme groups tended to have fewer members. • Over half of the E. coli proteins belong to paralogous groups, reflecting the prominent role of duplication and divergence in the evolution of the genome. The number and sizes of paralogous groups reflect the distinctiveness of the organisms and they can be used in cross genome comparisons. Protein coding sequences were obtained from GenBank and included the following genomes: Aquifex aeolicus, (AE000657); Archaeoglobus fulgidus, (AE000782); Aeropyrum pernix, (BA000002); Agrobacterium tumefaciens, (AE007869/AE007870); Borrelia burgdorferi, (AE000783); Bacillus halodurans, (BA000004); Bacillus subtilis, (AL009126); Buchnera sp. APS, (BA000003); Campylobacter jejuni, (AL111168); Clostridium acetobutylicum, (AE001437); Chlamydia muridarum, (AE002160); Chlamydophila pneumoniae CWL029, (AE001363); Deinococcus radiodurans, (AE000513/AE001823); Escherichia coli K-12, (U00096); Escherichia coli O157:H7 EDL933, (AE005174); Escherichia coli O157:H7, (BA000007); Haemophilus influenzae, (L42023); Helicobacter pylori 26695, (AE000511); Halobacterium sp. NRC-1, (AE004437); Lactococcus lactis subsp.lactis, (AE005176); Mycobacterium leprae, (AL450380); Mycoplasma genitalium, (L43967); Mycobacterium tuberculosis H37Rv, (AL123456); Methanococcus jannaschii, (LL77117); Mesorhizobium loti, (BA000012); Mycoplasma pneumoniae, (U00089); Mycoplasma pulmonis, (AL445566); Methanobacterium thermoautotrophicum, (AE000666); Neisseria meningitidis MC58, (AE002098); Pseudomonas aeruginosa, (AE004091); Pyrococcus horikoshii, (BA000001); Pasteurella multocida, (AE004439); Pyrococcus abyssi, (AL096836); Rickettsia prowazekii, (AJ235269); Salmonella enterica subsp. enterica serovar Typhi, (NC_003198); Salmonella typhimurium LT2, (AE006468); Shewanella oneidensis MR-1, (NC004347); Sinorhizobium meliloti, (AL591688); Staphylococcus aureus subsp.aureus Mu50, (BA000017); Streptococcus pneumoniae TIGR4, (AE005672); Streptococcus pyogenes M1 GAS, (AE004092); Sulfolobus solfataricus, (AE006641); Synechocystis PCC6803, (AB001339); Thermoplasma volcanium, (BA000011); Thermotoga maritima, (AE000512); Treponema pallidum, (AE000520); Ureaplasma urealyticum, (AF222894); Vibrio cholerae, (AE003852/EC003853); Xylella fastidiosa 9a5c, (AE003849); Yersinia pestis, (AL590842). Pairwise sequence alignments and scores were generated using the AllAllDb program of Darwin (Data Analysis and Retrieval With Indexed Nucleotide/peptide sequence package), version 2.0, developed at the ETHZ in Zurich . Maximum likelihood alignments are generated with an initial global alignment by dynamic programming [36–38] followed by dynamic local alignments . A single scoring matrix is used for these steps. After the initial alignment, the scoring matrix is adjusted to fit the approximate distance between each protein pair to produce the minimum PAM value. PAM units are defined as the numbers of point mutations per 100 residues . The final report includes PAM distances and variances. For the work reported here, sequence pairs were collected that had alignment lengths of at least 83 amino acids and distances of 200 PAM units or less. We chose the length requirement of 83 residues as it improves the significance of the sequence alignments for the more distantly related protein pairs . The requirement for at least 83 residues also avoids a class of commonly occurring protein domains smaller than 83 residues that appear widely in many otherwise unrelated proteins (such as small binding sites for a type of substrate, cofactor, or regulator). In addition for this study we removed proteins directly involved in horizontal gene transfer (IS proteins, transposases, and known prophage components) from the dataset. Proteins encoded by fused genes were identified from the E. coli literature and from unequal sequence alignments. The literature was searched for E. coli proteins with more than one function encoded at separate parts of the protein. The locations of the alignment regions in the proteins were analyzed for orthologous and paralogous protein pairs. We identified proteins with two or more non-overlapping alignment regions where each region aligned separately to smaller homologs. Figure 1a illustrates the alignment of two unfused proteins with parts of a fused protein. Multimodular proteins so identified were separated into independent modules. Using the pairwise data, start and end positions of the modules were estimated from the many alignment regions and were set to cover as much of the sequence as possible, not only the most conserved regions of all the alignments. No overlap was allowed between any adjacent modules. The sum of the separated modules from the multimodular proteins and the naturally occurring unimodular proteins of E. coli were aligned against themselves. Protein pairs aligning with >45% of the length of the peptides were used in a transitive grouping process as previously described . The transitive nature of the process ensures sequence similarity to at least one member of the group and does not require all members of the group to have detectable similarity to one another. This type of clustering allows for more divergent sequences to be grouped. The restriction of PAM value to no more than 200 prevents groups from expanding beyond significant similarity. We would like to thank Daniella Wilmot for assistance in preparation of tables and figures. The research was supported by the Office of Science (BER), U.S. Department of Energy, Grant No. DE-FG02-01ER63202 and by National Aeronautics and Space Administration Astrobiology grant NCC2-1054. MS designed the study, performed the sequence analysis, and participated in the data analysis and in writing the manuscript. MR participated in the data analysis and in writing the manuscript.